(October 31, 2004) -- A prominent Long Beach lawyer, who has urged greater caution over city management plans to significantly expand LB Airport's permanent terminal area facilities, alerted Sacramento legislators months ago to problems with Orange County's computer voting system...a matter that will be put to the test in the historic upcoming November 2 election. 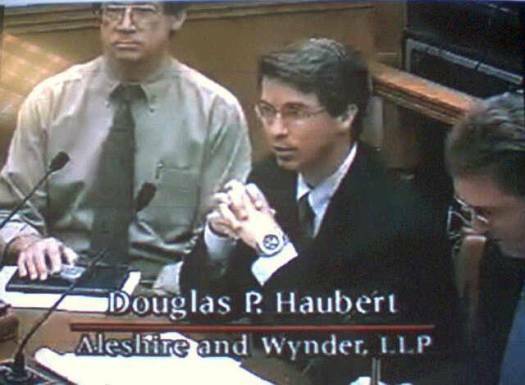 Doug Haubert, an ELB/4th district homeowner and member of LB's "Airport Advisory Commission," testified earlier this year before the state Senate's Elections and Reapportionment Committee in Sacramento concerning issues that arose in OC's computer voting system during the March 2004 election. The L.A. Times, OC Register and state Senators Don Perata (D., Oakland) and Ross Johnson (R., Irvine) variously criticized the new system in which thousands of voters may have voted the wrong ballots. Concerned that this might have affected an Assembly race, a statewide group hired Mr. Haubert (prounced ("HOW-burt"), who spent over forty hours at the OC Registrar's office observing and analyzing flaws in the March 2004 election. Although his client decided not to pursue an election challenge, the state Senate Committee invited Mr. Haubert to discuss OC's computer balloting problems and how to avoid them in the future. 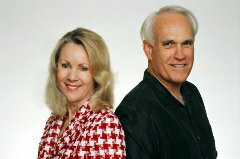 The hearing was telecast statewide on The California Channel. Mr. Haubert urged a number of changes, including offering paper ballots to voters who are uncomfortable with computer voting and requiring a paper trail so electronic tallies can be manually audited. It's not the first time Mr. Haubert has urged reforms in government procedures...sometimes offering lawyerly advice that officialdom may not have wanted to hear. In July 2004, Mr. Haubert confronted another thorny issue: expansion of LB Airport's permanent terminal area facilities. In fall 2003 (with Council elections looming in spring 2004), Councilmembers effectively delayed a decision on the hot button issue by sending it first to a Council-appointed "Airport Advisory Commission." Although the Council had packed its "Airport Advisory Commission" with members including current or former private pilots and others with aviation or travel ties, Mr. Haubert (among a minority with no such ties) charted an independent course that eventually collided with Airport interests. As unveiled in spring 2004, Airport management's permanent terminal area expansion plan was even larger than what it originally sought in fall 2003. Mr. Haubert countered that Airport management's larger proposal could needlessly invite a challenge to LB's Airport noise ordinance (currently protecting LB homeowners from unrestricted Airport flights). In an extemporaneous but methodical presentation, Commissioner Haubert argued that applying "industry standards" could undercut features that many people applaud and desire at LB Airport, including its compact size and short walking distances. "[Some critics] have compared our Airport to a "third world" airport. Well you know what, I've heard a lot more people praise our airport. I've heard a lot more people talk about the convenience of the Long Beach Airport. They don't have to walk a mile to get to their flight. [Airport management's recommended expansion sizes] so far have been based on what have been described as "industry standards"...Well you know what, industry standards are suggested guidelines to follow. And if we followed "industry standards" there'd be no Belmont Shore. There'd be no Colorado Blvd. in Pasadena or the Santa Monica Main Street. The "industry standard" would say with that number of shops you would need twice, three times as much parking, the streets would have to be four lanes instead of two lanes...You know what, they created a very pedestrian friendly, attractive shopping destination...[I]f you listen to the planners, it would be upside down; it should be a failure, Belmont Shore should be a failure, Colorado [Blvd. in Pasadena] should be a failure, the Gas Lamp [District] in San Diego should be a failure. And you know what happened, people looked at that and they saw that actually if you deviate from these "industry standards" you might actually improve on them, and now cities are using those as an examples of what they want they want to do..."
"...If our fundamental concern is retaining [our local control] I think we have to take strategic steps to make sure that we retain that control. And I don't think there's been any analysis here on the line of strategic planning. ...I know this is going to upset a lot of my neighbors and a lot of my friends, I don't think you can just stop at the need and just ignore the wants, because I do think we want to talk about the things that would make Long Beach Airport bigger...This is about convenience. I want to make this Airport more convenient. And that means we are going to have to someday expand the size of this terminal. We are going to have to make the holdrooms bigger. We are going to have to make the baggage claims bigger. We are going to have to go in that direction. ...We need to call [Airport management's proposal] what this is, and it's not a need, it's a want. This is not a necessity. We have 41 flights coming and going right now, and you know what, it works. JetBlue is doing a great job. Airport staff is doing a great job. It does work. People compliment our airport. They really do. We get great compliments about our airport. The parking is very convenient. Everything is convenient at the airport. Do I think we could make is better? I think this is a want. I think this is a convenience to the passengers that use Long Beach Airport and I support that. I support making it more convenient for them. [Haubert describes Alternatives he wants to see. Alternative A is Airport management's proposal]...Alternative B would be an alternative that encompasses all of these details but it's scaled down from Alternative A. And the third would be Alternative C which would be even scaled down further from Alternative B. And the purpose of these three Alternatives is to look at the varying degrees of how this could be expanded. I was going to talk about reducing by 1/3, and then another 1/3 [but] I'm not going to make that because I want staff to put together their thoughts on what could be done. And again, I really do think...we can talk about this in terms of what really, really is needed. And this may force staff to think more creatively on the use of space efficiently. But I want to talk about three Alternatives. I'm not going to put any [specific] parameters on staff, other than [Alternative] B should be reduced from what we see before us now [Airport management's proposal], and Alternative C should be reduced from that even further. And that would be my substitute motion." The final decision will be made by the City Council...and Haubert will almost certainly be part of the process. Earlier this month, he addressed an ELB community meeting called by ELB/Los Altos neighborhood activist/realtor Joe Sopo (and attended by the 4th district's new Councilman, Patrick O'Donnell) to discuss airport issues. At that meeting, Mr. Haubert reiterated his concerns about the magnitude of the proposed airport facilities now being proposed. When he's not busy at community meetings or tending to the home front with his wife and two kidlets, Mr. Haubert can be found at the law firm of Aleshire & Wynder, LLP, serving as City Attorney to a number of CA cities, including Signal Hill, Cypress and Palm Springs. He often advises City Clerks on campaign and election laws and guides officials on the Brown (open meetings) Act, the Political Reform Act and other ethics laws.